performance of the Opera Orchestra of New York’s Carnegie Hall season. 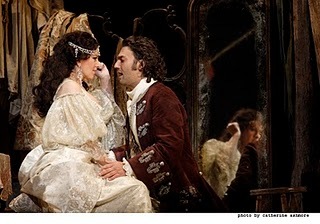 Ambrogio Maestri, and Anita Rachvelishvili in the other major roles. Love is a flame, friendship is its ashes. I love him with the fiery recklessness of one who has had her heart taken for the first time. You’re the sun that gilds the eternal Arctic night. Their eyes flash like pairs of blades, showing no mercy. Our love defies fate, eludes death in golden dreams. Nevertheless, I was totally crying at the end, go figure. Great review, so well-written! Thank you! Great review! I was there and agree with everything you said.